Not sure what to make for dinner tonight? Our food coordinator gives Gumbo YaYa's gumbo recipe a try and gives you a step-by-step run down of how it went. 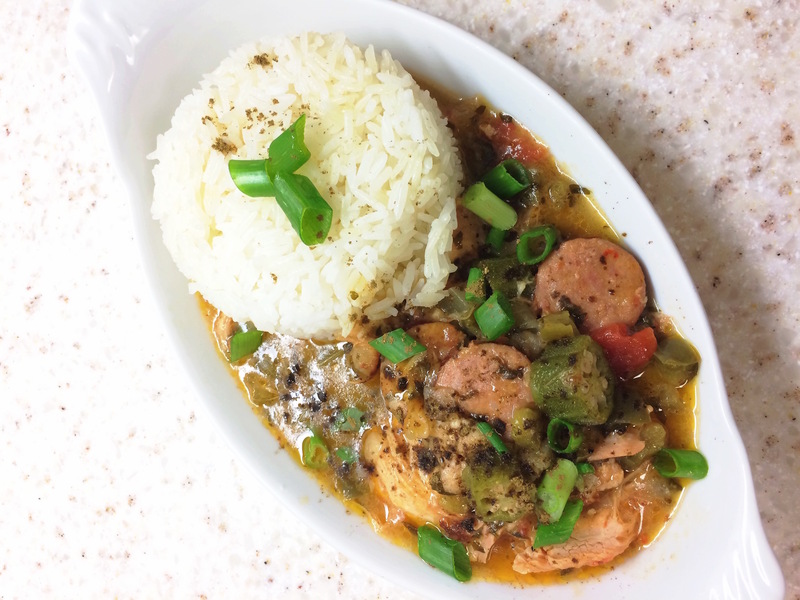 I have yet to try some authentic gumbo so when my professor Dr. J. Richards shared this recipe from Gumbo Ya-Ya in class, I knew I had to give it a try. Although the process of preparing this cuisine was complicated and long, it was worth the time and effort. Below are the ingredients and step the step directions of how to prepare some good ol’ chicken sausage gumbo. Make sure to alter the ingredients depending on the service size you require because the recipe below yields 5 quarts of gumbo which is equivalent to 20 cups. 1. Combine hen (or chicken, duck), salt and ½ teaspoon pepper in a large pot. 3. Cover, reduce heat, and simmer one hour or until duck is tender. 4. Remove hen (or chicken, duck) from broth; reserve broth. 5. Set meats and broth aside to cool. 6. Skim and bone hen (or chicken or duck). Coarsely chop meat. 7. Combine bacon drippings and flour in a large pot (or oven); cook over low heat 30 to 35 minutes, stirring constantly, until roux is a rich brown color. 8. Add celery and next 5 ingredients; cook over medium heat until vegetables are tender. 9. Gradually add cooled broth, stirring constantly. 10. Add sausage, hen (or chicken, duck), tomatoes, seasoned pepper, and hot sauce. 11. Bring mixture to a boil; reduce heat, and simmer 2 ½ to 3 ½ hours. 12. Add okra; cook an additional 20 minutes. 14. Cover and refrigerate 8 hours. 15. Remove fat from surface, and discard. Heat gumbo over medium heat, stirring occasionally. 16. Serve gumbo over hot cooked rice. 17. Sprinkle with gumbo file, green onions, or chives, if desired. Serve immediately.